I’ve always loved rail travel. It just seems like such a civilised way to get about. No “driving” hassles trying to keep your eye on the road if you’re driving or ascertaining your whereabouts if you’re the passenger (map reading is not my forte nor is trying to work out a Sat Nav system). You can sit back in your seat on a train, relax and enjoy the passing scenery. No worries about airports, checking in bags, going through security queues (except for Eurostar and even then it’s very straightforward) – the list is endless. I must have watched just about every TV travel show imaginable and I always love the ones with railways in them : Michael Palin on his world circumnavigations and more lately the Michael Portillo series Great British Rail Journeys and Great Continental Rail Journeys. Hence this is the first in a series of posts entitled “Railway Adventures”! Often when we travel we have no particular plan; we just look at a rail map and head off to a place on spec. Such was the day we decided to go off over the Brenner Pass from Innsbruck in Austria to Bolzano in Northern Italy. I’ve always been fascinated by border regions where cultures meet and mingle. Having studied history I knew that the northern part of Italy, the Suedtirol (South Tyrol), had been part of the former Austro Hungarian Empire but was separated from its northern cousins by the Treaty of Versailles in 1919. Hence it became a part of Italy where the majority of the population were native German speakers. I became even more interested as our son-in-law’s maternal grandfather had been brought up in Meran (Merano) on the Italian side of the Tyrol and then forcibly relocated to Innsbruck in the 1930s when the family refused to give up their German heritage under the Mussolini “Italianisation” plans for the area. Now it is an autonomous region of Italy (part of the impressively named Trentino-Alto Adige/Suedtirol) and an eclectic mix of Italian and German influences – definitely a place worth exploring. We consulted maps, guidebooks and the internet and found that the capital of the Suedtirol is Bozen/Bolzano (the German and Italian names respectively) and that the journey by train took precisely 2 hours – definitely manageable in a day. The train was operated jointly by Deutsche Bahn and the OBB (Oesterreiche Bahn). We enquired at Innsbruck railway station whether we could just board using our Eurail passes and were told no problem. Once on the train we encountered a rather officious guard who told us we needed to pay a supplement of around 19 Euros each, which, to save further hassle, we did. On the way back however our passes were sufficient by themselves. I even asked the guard whether we should pay a supplement and he looked rather surprised! What I found out later is that the Italian train service Trenitalia do not cooperate with the German and Austrians over their rail services into and out of Italy via the Brenner Pass. Perhaps this lack of cooperation has led to anomalies in ticketing and pricing? 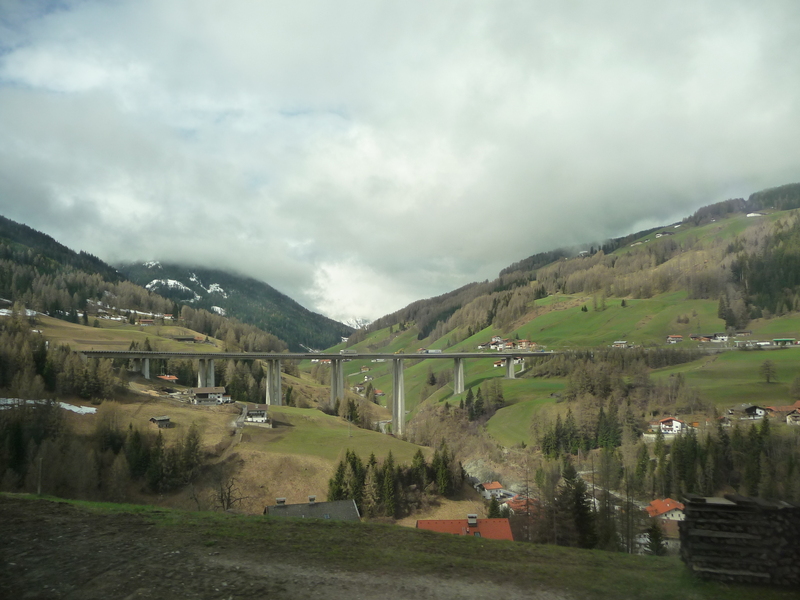 The rail line over the Brenner Pass is one of the most important north/south routes in Europe connecting northern Europe with Italy and especially the Lombardy-Venetia region. The highest point of the line at Brenner Station is relatively low by alpine Pass standards at 1371 meters but even so it was an extreme feat of engineering when the line was constructed in the 19th century. As the train winds up the slope towards the Italian border you get spectacular views of the mountains and valleys below and also a really good vantage point to see the magnificent Europa Bridge (Europabruecke) which spans 777 meters over the Wipp Valley just to the south of Innsbruck (the main road link between Austria and Italy). Scenery wise, south of the border crossing point at Brenner Station, you could still be in Austria as you ride past mountain villages dotted with alpine chalets and heavy wooden shutters. 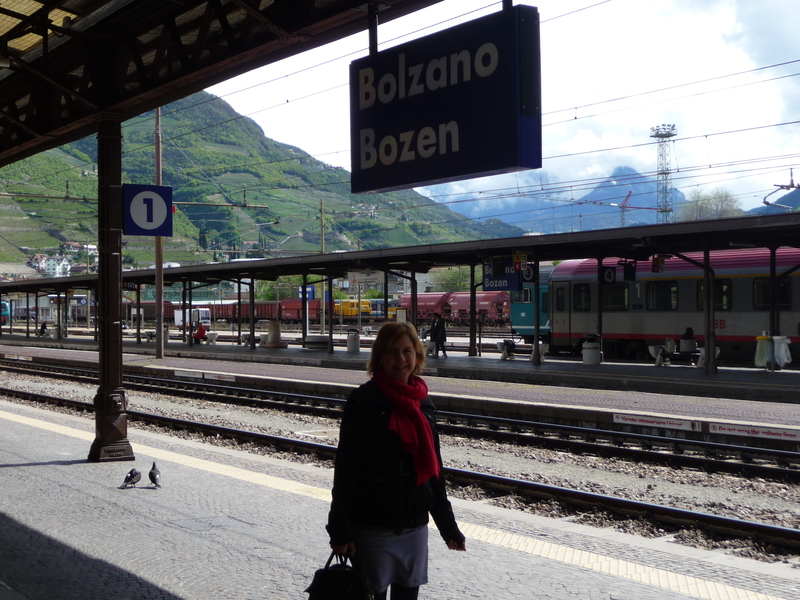 Apart from Brixen Bressanone there are no major towns en route until you draw into the station at Bolzano. Another reminder that this is high alpine country – we enjoyed pleasant weather on the outbound journey yet on the way back visibility was reduced to virtually nothing by a heavy and sudden onset spring snowstorm. Although we were there in April we were told that the Brenner Pass had been impassable only a couple of weeks earlier owing to heavy snowfall and we did wonder for a minute if we’d end up stranded at Brenner Station (like the old Orient Express in eastern Europe perhaps!). It wasn’t easy to take photos from a fast moving train but I did capture some of the moments as the train sped by (albeit with camera reflections!). The return journey over the Brenner Pass later the same day! Enjoying the hospitality in the dining car and watching the weather closing in outside. Monsieur Le Chic relaxing in the dining car and watching the snow storm outside (it got worse after this photo was taken)! If all goes according to plan most of the inter city trains will be re routed by 2026 via the new Brenner Base Tunnel currently under construction. This feat of engineering is aimed at easing congestion caused by the heavy build up of current traffic especially on the motorways. As the new tunnel will reduce the rail connection between Innsbruck and Bolzano from 2 hours to 50 minutes it is hoped that there will be a shift from road back to rail for freight transport thus easing pollution in the area. However for locals and visitors in less of a hurry, hopefully regional trains will still ply the beautiful scenic route over the tops of the mountains and down the other side – it is well worth the day out for the journey alone. Next time I’ll write about what we discovered in Bolzano/Bozen and its environs! Gorgeous photos and storytelling. We have seen also those train series You told in Your post. When possible we also love train trips, although I am a “car lover”. Recently we saw a rail road trip made in Australia and presented by a gentleman whose name I have forgotten. I was very curious to know Alice Spring is looking like.